Hiya guys! I can't believe we are less than a week away from Black Friday. I'm like scrambling to get my shopping list together... for friends of course. But I mean if I'm shopping I might as well throw in a thing or two for me too, eh? Haha. Thank goodness the polish community still be having tons of sales. I'll be sure to share as many as possible within the next few days so you guys can get your shopping on with me! 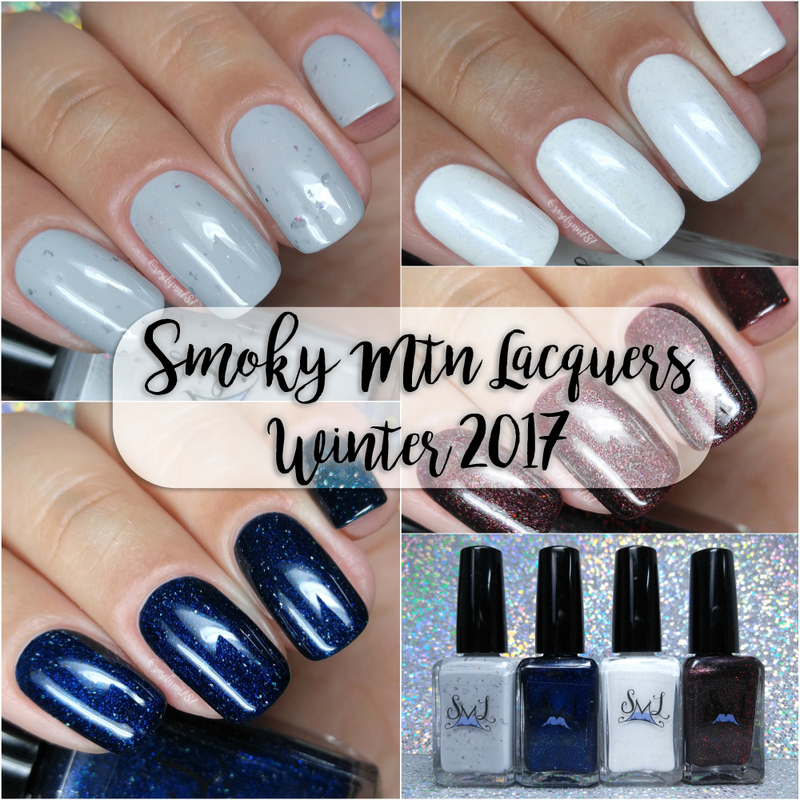 Now for today I'm sharing swatches for the Holiday/Winter Collection 2017 by Smokey Mountain Lacquers, which consists of four gorgeous shades in a crelly finish. I think I mentioned a few weeks ago how I needed more crelly finishes in my life and these came in to rock it! But gorgeous polishes can speak for themselves, so let's a go ahead and get started. The Holiday/Winter Collection 2017 by Smokey Mountain Lacquers will be available for purchase Sunday, November 19th at 7pm CST. Each full-size 15mL bottle retails for $10 and there will be no mini sizes available. The collection can also be purchased as a full-size set for $35. 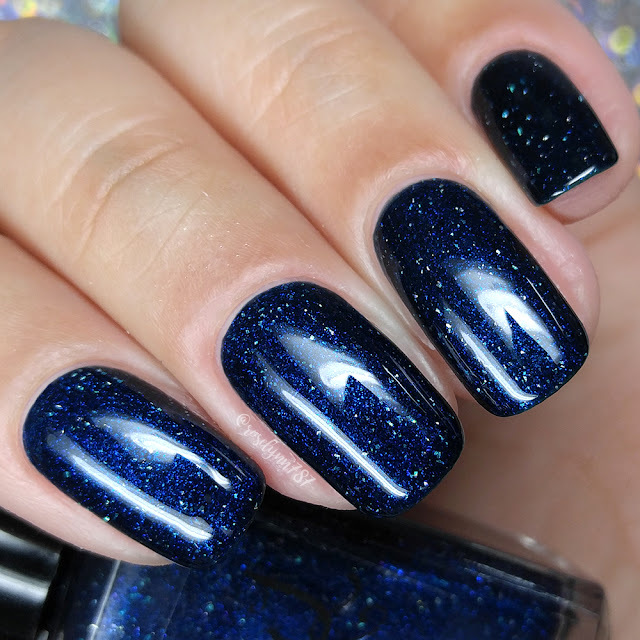 Sparkling Snow can be described as a white crelly with sparkle white micro glitters, silver holo micro flakies and a blue flash. The perfect white with a bit of pop to capture the essence of winter snow. The shimmer seems much stronger on the bottle and ends up being subtle on the nail. The formula has a very opaque and creamy application throughout. Definitely a great surprise as I don't usually expect white polishes to be so opaque. That said, it's not quite a one coater but it does have a balanced consistency. Not too thick or too thin, very easy to work with. It dries down very textured and will need double topcoat to smooth down. Shown in two coats and sealed with a glossy topcoat. Winter Night Sky can be described as a deep blue crelly with blue shimmer and silver holo micro flakies. 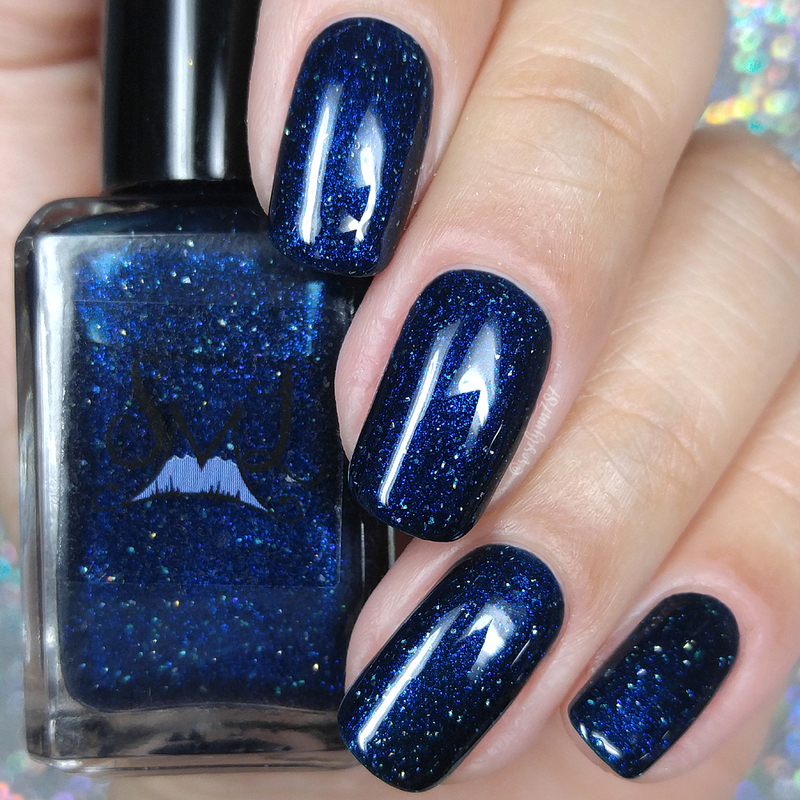 And here we have my favorite from this collection and probably my top pick this year when it comes to dark blues. Why? Simple... It doesn't stain!!! I seriously did a little pelvic thrust and scream while swatching this beauty. Plus it has so much sparkle and shine, it's truly stunning and irresistible. Needless to say, it's the must-have polish from this collection and for the season. The formula has great opacity and builds-up easily for full coverage. It has a perfect balanced consistency, not too thick or too thin. It dries down to a high-shine and smooth finish. As I mentioned before, I experienced no staining on removal to my nail beds or cuticles. Shown in two coats and sealed with a glossy topcoat. 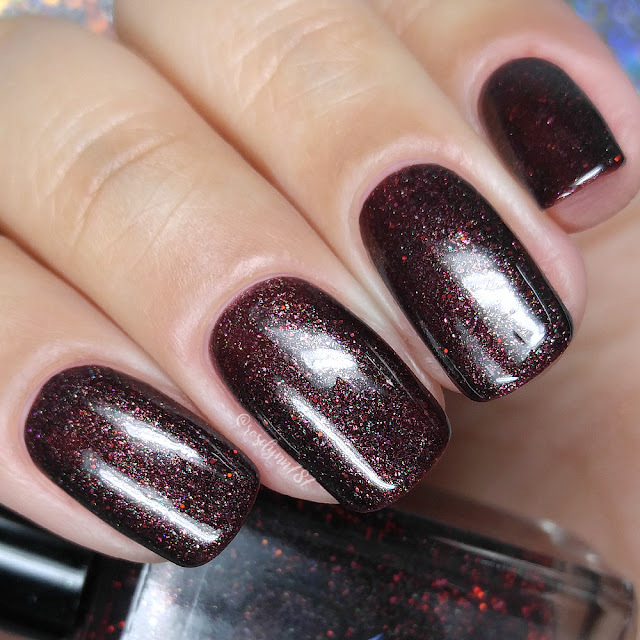 Berry Good Year can be described as a deep wine crelly with fire red holo micro glitter, green shimmer and red shimmer. The formula has a sheer application, but it builds-up well for full coverage. Also I experienced no staining on removal to my nail beds or my cuticles. Shown in two to three coats and sealed with a glossy topcoat. Cozy Scarf can be described as a medium gray crelly with fuchsia/green/gold UCC flakies and silver holo micro flakies. One of more unique shades in this collection, I always get super excited to see a gray polish. The flakies add a nice touch to give it a little bit more of a pop factor. That said, I do wish there were more flakies per brush stroke. The color itself though is super pretty and compliments my skin tone. The formula has great opacity throughout the application and builds-up evenly. Consistency wise it leans on the thin side, but it's manageable and easy to work with. The flakies are a bit on the scarce side, but it will contain more for the release batches. It dries down to a smooth and high-shine finish prior to topcoat. Shown in two coats and sealed with a glossy topcoat. To recap, Holiday/Winter Collection 2017 by Smokey Mountain Lacquers will be available for purchase Sunday, November 19th at 7pm CST. Each full-size 15mL bottle retails for $10 and there will be no mini sizes available. The collection can also be purchased as a full-size set for $35. I really like Berry Good Year & Winter Night Sky!